The Middle East is a different place, a complex place. The Russians have a relevant expression from an old Soviet movie classic about it: “The Orient – it’s a subtle matter.” When multiple outsiders compete in this region the consequences will inevitably be unintended. But not unpredictable. In the Middle East, outside military interference tends to make matters more complex and difficult. This is even more true when conflicts within the region are coupled with a multipolar great power rivalry as opposed to a more balanced and balance-able bipolar or even unipolar structure of strategic action. The most recent history confirms this. American and Russian interventions in the troubled region over the last few decades have produced the unintended consequences of empowering Iran, waking Saudi Arabia, and threatening Israel’s national security as well as overall ‘peace’ in the entire region and beyond. The American invasion of Iraq and overthrow of Sadaam Hussein created a pluralist if unconsolidated democracy that was bound to be dominated by the majority Shia against the minority Sunnis and Kurds. This structure of Iraqi domestic strategic political action in combination with instability caused by jihadi and Kurdish insurgencies and the presence of Iran over the border has led almost inexorably to Iran’s ascendance inside Iraq. Baghdad is destined in such conditions to become a mere puppet of Teheran. The U.S. intervention in Syria led not just to the near toppling of the regime of Iran’s top regional ally, Bashar Assad, but expanded Iran’s reach in the region and provoked Russia’s intervention in the Syrian civil war. The war has increased Assad’s dependence on Iran and increased Iran’s capacity in Lebanon through its Shia proxy force, Hezbollah. Russia’s thus far successful intervention in defense of Assad has strengthened Moscow’s influence across the region. Russia’s air and missile war against the Islamic State, Al Qa`ida and other less affiliated jihadi and Islamist revolutionary groups, who dominated the Syrian opposition has further facilitated the advance of Iran and Hezbollah in both the war to save Assad’s regime and the internal politics of Syria and Lebanon. The later development was underscored this past week when Lebanese Prime Minister Saad Hariri unexpectedly resigned Saturday during a trip to Saudi Arabia, saying his life was in danger and warning that “Iran controls the region and the decision-making in both Syria and Iraq” (http://edition.cnn.com/2017/11/04/middleeast/lebanese-prime-minister-saad-hariri-resigns/index.html). Moreover, given Russia’s relations with Teheran as a tactical and often strategic ally in the region, Russia’s alliance with China and China’s own tepid support for Teheran has further shifted the correlation of forces in the Middle East in Iran’s favor. This has enabled Iran to make moves in Bahrain and advances in Yemen against its main Sunni adversary in the region, Saudi Arabia. Most recently, the Arab coalition fighting against the Iranian-backed Houthi militia in Yemen said on Sunday that it considered an intercepted November 3rd missile attack on Riyadh from Yemen to be a direct military aggression by Tehran and possibly an act of war against Saudi Arabia and affirmed the kingdom’s right to legitimate defense of its territory and people as stated in Article 51 of the UN Charter. The statement added: “Saudi Arabia also has a right to respond to Iran at the appropriate time and manner, supported by international law and in accordance with its inherent right to defend its territory, its people and its interests protected by all international conventions” (https://english.alarabiya.net/en/features/2017/11/06/Arab-coalition-affirms-Saudi-Arabia-s-right-to-respond-to-Iran-s-act-of-war-.html). Over the last year, the Saudis have been increasingly active in Syria and beyond. They seem to be getting the House of Saud in order in preparation for something big. In summer, the Saudis concluded a deal involving $110 billion with the Trump administration and U.S. arms vendors. Members of the royal family have implemented an energetic diplomatic offensive, featured in the last week by arms deals with Russia and Ukraine. Reforms allowing women to drive and the purge of the crown prince ranks around the time of Hariri’s trip to the kingdom appear part of an overall sense that the Saudi regime needs to be reinforced for the upcoming struggle with Iran. In addition, Iran’s growing role in Lebanon and Hezbollah’s new strength puts Israel’s security poses a great threat to Israel’s national security and poses high risk that another Israeli-Lebanese war is at foot; one that threatens to bring in Iran and perhaps the Saudis in a strained tactical alliance with Israel and the West. Escalation from there brings in the great powers, the U.S., Russia and perhaps, in limited fashion, even China. In other words, a world war can result. Great power competition in conditions of multipolarity in international affairs frequently produces war. As in Crimea in the mid-19th century, when great power competition led to the real first world war, the Crimean War. As in the Balkans in the late 19th and early 20th centuries, when Western, Turkish and Russian contestation led to several wars, including World War I. As in the mid-20th century, when communist, fascist and Western twilight struggles led to World War II. So too, in Ukraine and Syria in the early 21st century, great powers are meddling in regional politics to increase or maximize their global power, and the consequences are likely to be similarly unintended, unmanageable and down the road unfathomable. 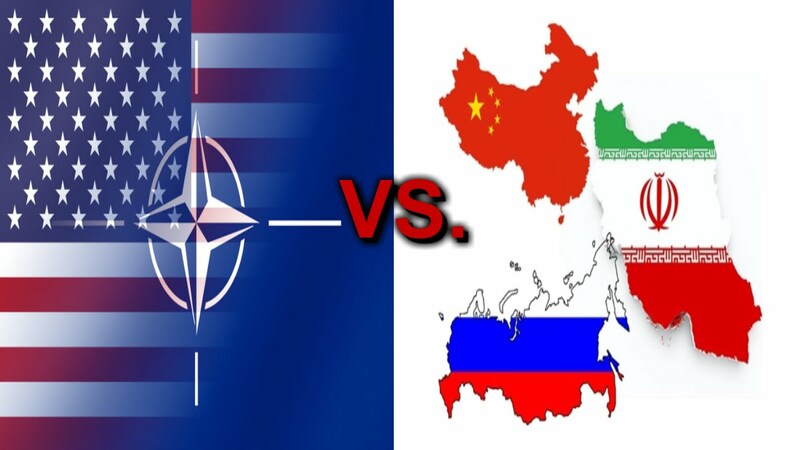 NATO expansion, EU enlargement, Russian security concerns and pushback, and the rising of a great power in China isolated more from the risks of a great war centered around Ukraine and/or Syria are together creating a highly unstable multipolar dynamic. The West’s support for destabilizing democracy-promotion in Ukraine and Russia’s preference for stability on its borders — something which pales in significance compared to their military interventions in the Middle East — ended in Ukraine’s loss of Crimea, a civil war in Donbass, and a ‘new cold war’. A prelude with similar dynamics occurred in Georgia in August 2008. We are soon to learn the myriad of new consequences induced by the U.S. and Russian interventions in Iraq and Syria. They are very unlikely to be good. One can only hope that they will be limited to a slight escalation of the ‘new cold war’ rather than its transformation into a hot one. Who's Been Interfering in Whose Politics?